LIVE Real Estate Marketing Class! You have an awesome opportunity to learn strategies that will help you take your business to the next level! Join us on Tuesdays for Free Online Strategy Classes. Our host, Scott Hudspeth will share the latest marketing strategies & will interview top agents around the country, sharing tips that will dramatically impact your business! Equal Housing Opportunity Lender. Land Home Financial Services, Inc. is a mortgage finance company and does not represent parties to Real Estate transactions or operate as a Real Estate company. 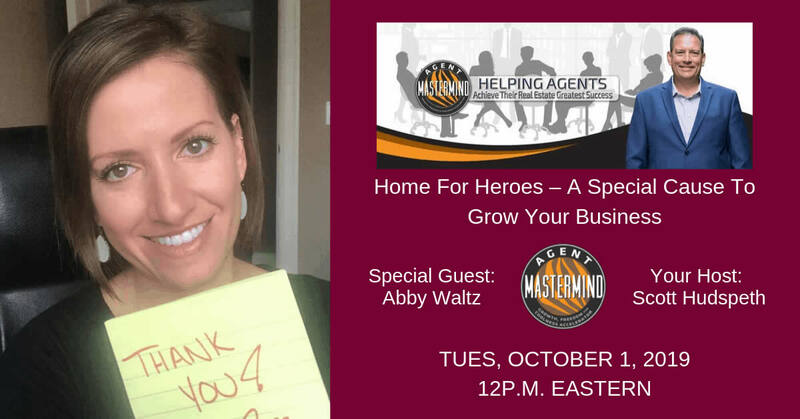 The Agent Mastermind free webinars and marketing strategies are a service of a third party vendor, is offered as a convenience service only, and should not be construed an endorsement of any particular company. The accuracy of all information, regardless of source, is not guaranteed and should be personally verified through personal inspection by and/or with the appropriate professionals. Land Home makes no guarantee or promises on success from the use of these services. Use of these services are not to be construed as a commitment to lend. Land Home Financial Services, Inc. only conducts business in the states it is licensed in. Washington Consumer Lending License CL #89331.